One of the most critical tests of a pest control company’s genuine commitment to protecting the planet — “guardians of the environment,” as the National Pest Control Association so effectively phrased it in the 1990s — is how its technicians are instructed to handle complaints about non-harmful, overwhelmingly beneficial creatures that are nevertheless viewed with alarm by much of the general public. How do we reconcile our professional imperative to educate about the natural world with a property owner’s prerogative to control whatever he or she considers a pest? This upscale, commercially manufactured product not only includes bored holes and hollow tubes for bees and wasps, but also compartments filled with a range of different natural materials that other insects can use for shelter. Many of these awkward situations involve species with a scary demeanor masking a benign temperament — black rat snakes and cicada killers immediately come to mind. But to my way of thinking, the pinnacle of common pseudo-pests are the smaller mining or digger bees in the families Andrenidae, Halictidae and Colletidae. Diminutive, fuzzy and industrious, they hardly seem like the type of animal that would provoke a call to the exterminator. But they tend to appear suddenly and in large numbers, coursing back and forth over their nesting grounds and, to the average layperson, closely resembling truly pestiferous yellowjacket workers (also often unfortunately referred to as “ground bees”) which become numerous much later in the season. In an ideal world, the technician answering this type of call would be knowledgeable about the fine points of Hymenoptera biology and would point out four critical truths to the client: 1) most of the bees flying around are totally harmless males, which cannot sting; 2) stings by the non-aggressive females are extraordinarily rare and only happen by improbable accident; 3) the bees will disappear in a few weeks in any case; and 4) most important, these insects are not just inoffensive but providers of what are now fashionably referred to as “ecosystem services” to mankind because of their vital role as pollinators. In real life, on the other hand, it is a highly unusual pest control firm, no matter how enlightened the management, that will actually walk away from a request to treat an aggregation of solitary bees. It’s a thorny issue, but there is, in fact, a compelling and relevant way that we can work towards balancing the ledger with a gesture of pollinator promotion that is a natural fit with our industry. We can, at least symbolically, give homes back to the bees. 5/16-inch diameter holes in the face of a wooden block originally intended to house orchard mason bees have instead been occupied by other species in the family Megachilidae. The green and tan flakes are pieces of leaves or flowers that the bees cut to separate their nest cells. On the lower left, a parasitic chalcid wasp probes the oozing resinous plug sealing a nest of the introduced giant resin bee. TRAPS, BINDERS & HOTELS. Providing artificial nesting cavities for solitary bees and wasps is a venerable pursuit that has evolved three basic lineages over the years. At first, the emphasis was on basic biological study. Published accounts go back to the legendary naturalist Jean-Henri Fabre in the early 1900s, who used reeds for the purpose and throughout the first part of the century several researchers followed suit with a variety of methods. However, no person did more to popularize the concept than Karl Krombein, one of the world’s great hymenopterists, who in 1953 began systematically setting out pine blocks with borings of several different diameters to lure in solitary wasp and bees species that normally would either excavate tunnels in natural plant material or (much more often) use pre-existing cavities, such as hollow stems or the galleries of other insects, in which to nest. The blocks were then split lengthwise to inspect the contents and subsequently taped back together for re-use. His unique masterpiece, Trap-Nesting Wasps and Bees: Life Histories, Nests and Associates (Smithsonian Press, 1967) provided 11 years’ worth of data gleaned from more than 3,400 traps utilized by about a hundred species and almost as many parasites and predators that exploited them. It is still the definitive reference work on the subject. At about the same time that Krombein was perfecting techniques that used artificial nest sites purely for observational purposes, an entirely different application was being explored by agricultural researchers in the Western U.S. and Canada. The goal was to create a system to propagate large numbers of certain bees in the family Megachilidae so that they could be efficiently deployed as pollinators of fruits, vegetables and forage crops. Starting out with bundled paper straws, the approach eventually adopted by commercial suppliers was to route out numerous adjacent channels on large boards that were then bound together to form cylindrical tunnels — thus termed binders or binder boards — to produce transportable and stackable containers for housing a concentrated bee population. (Nowadays, molded plastic boards also are used.) Two megachilid species have been the superstars for this industry. The tiny, introduced alfalfa leafcutter bee (Megachile rotundata)was the first and by far the most successful, use of a solitary bee for managed pollination in North America. Domiciles for this species that are hauled into alfalfa fields can be as large as truck trailers and accommodate many thousands of bees. The native blue orchard bee, or orchard mason bee (Osmia lignaria) is used primarily to pollinate fruit and berry crops in the spring, but is not commercially available at anywhere near the scale as M. rotundata. A tiny leafcutter bee (Megachile sp.) pulls out material from last year’s nest inside a cavity less than 3/16” wide in a strip of mortar. Many species of small, solitary bees utilize the walls of structures for nesting but are seldom observed because of their speed and small size. The third iteration of man-made solitary bee condos arose only recently as a result of growing societal awareness and concern over the decline of many species of pollinators as a result of increasing environmental degradation. Starting at the end of the 20th century and rapidly gaining traction during the first decade of the 21st due to the sudden onset of colony collapse disorder in honey bees, the widely publicized “pollinator crisis” spawned what might be termed the “pollinator movement.” Common expressions of interest and support for these indispensable, winged components of the ecosystem include reduced mowing along highway margins and median strips, a growing interest in small-scale beekeeping and a rebranding of the original butterfly garden concept to emphasize bee-friendly plants in public landscapes and private gardens. SENDING A MESSAGE. The earliest bee hotels were usually nothing more than wooden blocks about the size of a small bird house, with rows of drilled holes and a simple roof. They now come in all conceivable shapes and sizes and range from polished, “designer” models to much cruder, no-frills assemblages. Many hotels have an array of different cavity widths and utilize multiple construction media, including bundles of hollow stems, cardboard tubes or pieces of bamboo; drilled pieces of wood; and even ornamental masonry blocks. On the cutting edge, the trend is for increasing scale — a few of the larger creations are ornate walls on the same magnitude as commercial M. rotundata domiciles — but also for esthetic creativity. This homemade, intentionally rustic bee hotel combines coarsely drilled and routed wood with tubes bundled in sections of PVC pipe. Indeed, in its most exalted state, the discipline has emerged as a new type of outdoor art form. Artificial bee nesting sites have become the latest manifestation of what might be termed “ecosculpture,” imaginative but functional creations of natural materials that are allowed to weather and ultimately degrade. Many of them are exquisitely beautiful or striking examples of outreach to enhance public awareness of pollinators. The University of Maryland campus in College Park, for example, is home to a contoured, 24-foot “bee habitat” made of cob (a clay/sand/straw mixture) with holes of various sizes poked with chopsticks during its construction. 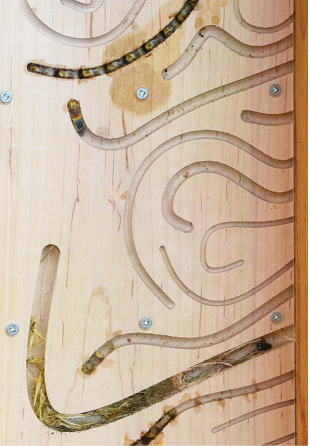 Embedded in this wall is a “bee booth,” a wooden cabinet enclosing curved, routed tunnels covered with an acrylic panel and wired so that visitors can not only observe, but listen in with headphones as the occupants go about their business. It certainly takes the original trap nest concept to an entirely different level. Solitary Hymenoptera that occupy bee hotels are mostly species that prefer to nest in pre-existing, above-ground cavities. Mining or digger bees usually excavate their own nesting holes in the ground. Despite a few exceptions, these are generally two different groups of organisms. Bee hotels are utilized by what are often termed “wild pollinators,” as opposed to the domesticated honey bee and, as such, are all firmly in the “beneficial” column. But they are certainly not all “native” bees, as is often claimed. Studies in California and Toronto have revealed that roughly three-quarters of bee hotel occupants are actually introduced species. On a functional basis, bee hotels as yard art are definitely not a miniaturized equivalent of the intensely-managed commercial operations that mass-propagate megachilids for agricultural service. The latest critique on hotel efficacy by J. Scott MacIvor and Laurence Packer, entitled “‘Bee hotels’ as tools for native pollinator conservation: a premature verdict?” (PLoS ONE, March 18, 2015) found evidence that the devices served to concentrate brood parasites, predators and diseases and should not be automatically regarded as playing any measurable, positive role for local populations of their target species. Inside the viewing cabinet of the bee wall at the University of Maryland, a few months after completion. The larger tunnel at the bottom is full of paralyzed tree crickets collected by a grass-carrying wasp in the genus Isodontia. Nevertheless, all of the previously mentioned are essentially beside the point. As incalculably minuscule constructs compared to their surrounding habitat, bee hotels could never be mistaken for serious examples of ecosystem engineering. They are meant to be entertaining, educational, decorative and symbolic. So let’s return to the connection with the pest control trade. A good parallel with ground-nesting solitary bees in the yards of entomophobic clients are structural colonies of bats, which present the same conundrum of an environmentally stellar group relegated to “pest” status because of their occasional, unfortunate choices in real estate. Recognizing a priceless teachable moment, some companies that perform bat eviction and sealing work also prominently market bat houses (both plans and the actual articles) on their websites and in their promotional literature, to emphasize a balanced sense of perspective about the subject. I don’t regard this business practice as inconsistent in any way — it is an astute public relations strategy for sending a powerful message that our professional ethos consists of a far broader world view than simply exterminating things. The same goes for vigorously supporting the pollinator movement and its conspicuous emblem of the bee hotel. Don’t just be a bystander as society evolves around you. Check out these fascinating creations today! The author is entomologist and national IPM coordinator for the Public Building Service, U.S. General Services Administration (GSA), Washington, D.C. The opinions expressed herein are the views of the author and do not necessarily reflect the official policies or positions of GSA.